Mövenpick Hotels & Resorts describes its latest growth spate as having an organic quality. New hotels in Turkey, Mongolia and Morocco, the remake of a landmark hotel in Pakistan and the opening of a new "hotel within a hotel" in Egypt are all offered as examples of the approach. The 407-room Mövenpick Hotel Karachi took over from a five-star landmark hotel by Sheraton. Renovations will begin later this year. Mövenpick is adding two more properties in Morocco. By summer the company will take over management of the 184-room Mövenpick Hotel Casablanca. Formerly known as Hotel Casablanca Plaza, the 16-story hotel was completely renovated in 2011 and will see further enhancements to its restaurants and bars. The company’s third Moroccan property, the 374-room Mövenpick Hotel Marrakech is scheduled to finish construction late this year. It will feature the largest swimming pool in Marrakech as well as a shopping mall, on-site branded Buddha Bar, Hard Rock Cafe, Kidzo entertainment zone, and an ice-skating rink. 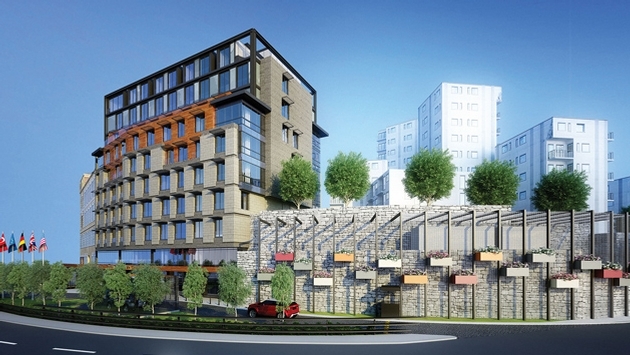 The 137-room Mövenpick Hotel Istanbul Golden Horn is scheduled to open this summer near Sultanahmet, the city’s Old Town. In building the hotel, Mövenpick used the latest international sustainable standards, using recycled materials and the latest energy and water saving technology. In 2018, Mövenpick will begin managing the 250-room (and 124 residence) Mövenpick Hotel & Residences Ulaanbaatar in the city’s Banyanzurh District about 2 miles from the historic center of Sukhbaatar Square. Finally, Mövenpick Hotels & Resorts has just opened a new 144-room "hotel within a hotel" at Mövenpick Hotel Cairo Pyramids, only minutes from the Pyramids of Giza. The new four-story hotel extension offers an alternative to the renowned existing garden village bungalow resort. All the new rooms have terraces – some with views of pyramids. Vienna International Hotels and Resorts (VIH) chose the ITB in Berlin as the perfect setting to celebrate two anniversaries: the 25th anniversary of VIH and the fifth anniversary of the andel’s Hotel Berlin. The hotel group, which launched in 1989, has established a strong brand as a modern hotel group with contemporary sensibility and an ability to cater to travelers in Eastern Europe. VIH manages hotels in Poland, the Czech Republic, Russia, France, Germany and Romania. In its five years, the andel Hotel Berlin has accommodated over a million guests. Guests spent an average of 2.4 nights at the design hotel and booked a total of 667,857 rooms. The hotel received the Top Hotel award by HolidayCheck and the Traveller’s Choice Award by TripAdvisor. The fine-dining restaurant a.choice has been awarded a number of culinary distinctions including 13 points in Gault Millau and 2 forks and spoons in the Michelin Guide. VIH hotels took over two hotels at Disneyland Paris, The Magic Circus Hotel and The Dream Castle Hotel and within a short amount of time managed to increase the profitability of the first 400-room property. Only one year later, the hotel investor was so pleased with the initial outcome that VI assumed management of a nearby second hotel of the same size. In the second half of 2013, VIH took over six Arcadia Group hotels. VIH acquired the Arcadia Hotel Schloss Goldschmieding in Castrop-Rauxel and plans to further increase its presence on the German market. The VIH portfolio, which also includes one Leading Hotel of the World, comprises city, resort, spa and conference hotels. The hotels are located in nine European countries: Austria, the Czech Republic, Poland, Croatia, France, Germany, Romania, Slovakia and Russia. In addition to holiday and leisure products internationally, e.g. in Loipersdorf, Salzburg, Carlsbad and Opatija, the focus of the destinations is on business centers such as Salzburg, Munich, Berlin, Paris, Prague, Cracow, Lódz, Bucharest and Ekaterinburg. The hotels under management by VI generated €177 million in revenue with 2.4 million bed nights in 2013.